Smooth, Low Profile Look with Fresh Air Functionality! The Auto Ventshade Seamless Ventvisor is the look high-end enthusiasts have been waiting for. 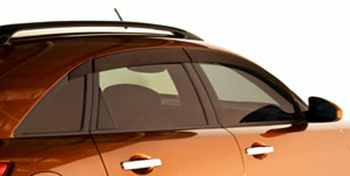 A new generation of luxury Ventvisors designed to complete and enhance the look of your luxury vehicle with subtle style and understated elegance. Precisely engineered to strict standards using state-of-the-art, computer-aided design and analysis technology, they are still meticulously manufactured and hand inspected by experienced highly skilled craftsmen. Like the original Ventshade which AVS invented nearly 75 years ago. 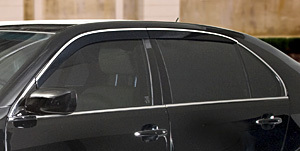 Auto Ventshade Seamless Ventvisor keeps rain out, let fresh air in and keep the automobile's interior cooler by allowing drivers to leave the windows open just the right amount when they park on a warm or sunny day. Reduce Heat In Parked Vehicle By Allowing Windows To Be Kept Open Just The Right Amount. Available in four or six piece sets (an industry first). 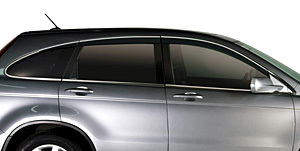 Auto Ventshade Seamless Ventvisors are all finished in smoke gray and with thin ribbon of chrome trims on selected models to match the trim of specific vehicles. Easy to install. Perfect for keeping the rain out and letting fresh air in. Choose from stainless steel or black finish. 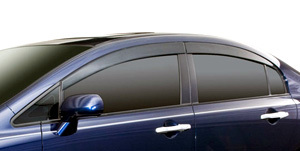 Deflectors keep rain out and let fresh air in!